Iran’s nuclear deal offers the world a ray of hope. It won’t be easy to turn the agreement to curb Tehran’s nuclear activities from a six-month accord into a lasting solution that assures the world the country’s nuclear programme is peaceful. But the resulting diplomatic goodwill should make it harder to go backwards. The initial deal with six world powers effectively lengthens the time it would take for Iran to build a bomb. In return, Tehran gets limited relief from sanctions worth up to $7 billion. Senior U.S. administration officials estimate that is equivalent to 20 percent of Iran’s budget deficit, or 23 percent of the oil revenues it would lose over the six months. It’s a good first step which helps ease geopolitical risk in the red hot Middle East. The alternative was an unraveling of the international sanctions coalition and possibly even a Western-led war with huge costs and unknown political consequences. As long as the accord holds, that scenario – and the risk of unilateral military action by Israel – is greatly reduced. Even though the supply of Iranian crude won’t change for now, improved sentiment should push oil prices back down from current levels over $108 per barrel. A lasting deal would enable a full reintegration of Shi’ite-led Iran back into the global economy, with profound consequences. Biting energy and financial sanctions could start to unwind. The eventual return of 1.5 million barrels per day of lost Iranian crude would change the dynamics of the oil market, even if other oil producers responded by cutting production. An influx of foreign investment would strengthen the region’s second biggest economy and help counterbalance the immense regional power of the Sunni monarchies led by Saudi Arabia. But there are plenty of obstacles to overcome first. Any final deal will face domestic political resistance. The two sides need to agree on whether the current framework represents a floor or a ceiling to Iran’s nuclear activities, warns Barclays. Eurasia Group ascribes only a 60 percent chance of the current agreement turning into a lasting one. Still, it was hard to imagine such a rapprochement just six months ago. That alone is a reason to be hopeful. 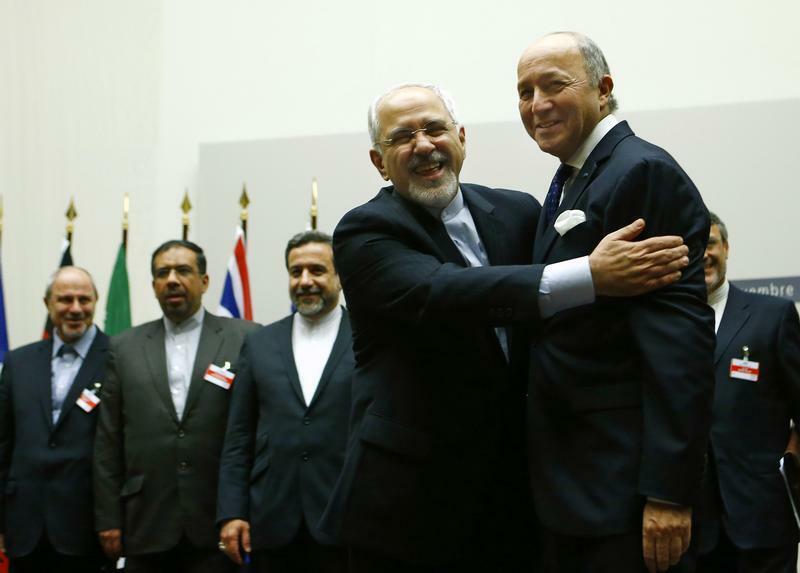 Iranian Foreign Minister Mohammad Javad Zarif (2nd R) hugs French Foreign Minister Laurent Fabius after a ceremony at the United Nations in Geneva November 24, 2013. Brent oil futures fell $2.51 to $108.54 a barrel by 0400 GMT on Nov. 25 after Iran reached a deal with six world powers that will curb its nuclear programme in exchange for modest relief from sanctions. The agreement with the United States, United Kingdom, Germany, France, Russia, and China, facilitated by the European Union and endorsed by Iran’s Supreme Leader Ayatollah Ali Khamenei, will last for six months and is renewable by mutual consent for a further six months. During that time, the two sides will try to reach an agreement on a comprehensive solution to assure Iran’s nuclear programme is peaceful. As part of the deal, Iran has committed to halt enrichment of uranium above a concentration of 5 percent, neutralize its stockpile of near 20 percent uranium, halt progress on its enrichment capacity and halt progress on the growth of its 3.5 percent stockpile. It will also stop progress on its activities at the Arak heavy water reactor. The deal will also allow unprecedented monitoring of Iran’s nuclear programme. In exchange, Iran will be granted “limited, temporary, targeted and reversible relief” worth up to $7 billion. That will include access to $4.2 billion of revenue from oil sales and sanctions relief worth $1.5 billion relating to trade in autos, gold, and petrochemicals. No new nuclear related sanctions will be imposed for six months and buyers will be permitted to continue buying Iranian crude at current volumes. The bulk of financial sanctions will remain in place. Iran’s oil exports have fallen from 2.5 million barrels per day (bpd) in early 2012 to around 1 million bpd. The U.S. estimates that oil sanctions alone cost Iran $5 billion in lost revenues each month. The deal follows the victory of moderate cleric Hassan Rouhani in Iran’s presidential election in June.